Eggs are a great staple of any diet. They are extremely versatile and quite healthy for you. They are rich in protein but low in calories. Although they have been demonized for their high level of cholesterol, they are actually high in “good cholesterol” and help to lower your bad cholesterol levels. 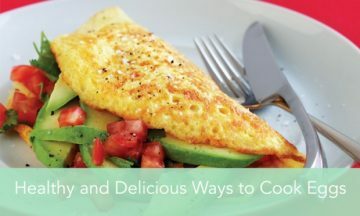 Check out a few of our favorite healthy and easy ways to cook eggs below. Poached eggs are a delicious addition to a slice of whole grain toast or an English muffin and are one of the healthiest ways to prepare eggs since they don’t require oil or butter like some cooking methods do. Poached eggs can be a little intimidating to make, but are actually quite easy once you learn a few little tricks. My favorite poached egg tip: add a splash of white vinegar to your simmering water before you add the egg to help hold the white together better. Check out this Youtube video on making the perfect poached egg! An omelet is a great choice for breakfast. Add your choice of vegetables, cheese, or meat, and you have a nutritious and filling start to your day. My favorite omelet tip: add a splash of non-fat milk to your eggs while you whisk to make them super fluffy. Check out this pin for tips to making the perfect omelet! This classic favorite to preparing eggs is a great place to start if you have never cooked eggs before. Simply crack the eggs in a bowl and stir with a whisk or a fork, adding some salt, pepper, and a little non fat milk (if you like them fluffy) and pour into a hot skillet. Then, just use a spatula to move the eggs around slightly until they are cooked to your liking. Healthy Tip: Using a nonstick skillet to scramble your eggs prevents the need to use butter or oil to prepare them. Check out this pin for how to make the perfect scrambled eggs! Boiled eggs have a great versatility factor to them. Like poached eggs, you are only using water(or you can bake them in the oven for the same affect), adding no extra fat to them while they are cooking. Boiled eggs are great just eaten by themselves or made into an egg salad. Check out this pin for making perfect boiled eggs! If you are looking to cut back on your fat, egg whites are also a great option. I love them scrambled or on a sandwich with some turkey. They are also great in an omelet with your favorite veggies. Check out this pin for a great egg white omelet recipe! Quiches are great to make when you will be feeding breakfast to a handful of people or when you are taking a breakfast dish to a potluck. You can add meat, cheeses, and veggies, depending on the taste of your crowd. They are also a great dish to make ahead and just warm up before serving. Check out this pin for a great quiche recipe! Frittata’s are delicious and great to make ahead of when you will need them. They are similar to quiches but do not have any cream or crust, so they are slightly lower in calories, but equally as versatile and delicious. I love using an iron skillet in my cooking when I get the chance, and frittatas give you that chance! Check out this pin for a great frittata recipe!